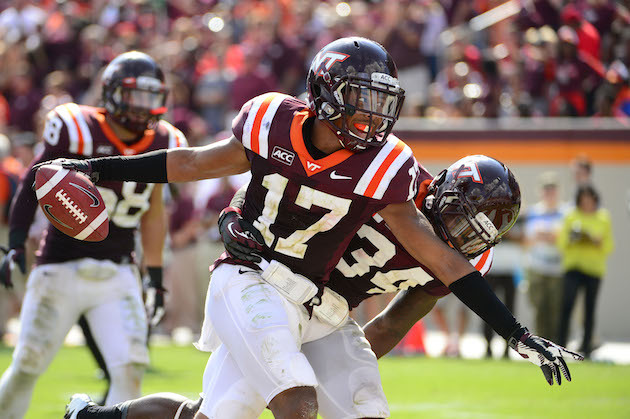 Virginia Tech's Kyle Fuller will miss four to six weeks after surgery to fix what the team is terming a "core muscle injury." Kyle Fuller underwent successful surgery to repair a core muscle injury on Tuesday in Philadelphia; full recovery in 4-6 weeks. Fuller, a senior, was regarded as one of the top cornerbacks in the country at the beginning of the season and he was originally injured in the bye week before the Duke game on October 26. However, it's obvious that the injury wasn't getting any better, nor that Fuller was going to be able to play this season. He has 10 pass breakups in eight games this season. His replacement is his younger brother, Kendall. Virginia Tech has not played well while he's been absent. The Hokies have taken themselves out of the race for the ACC Coastal Division. VT is 4-3 int he conference, a game behind Duke. And Duke has the tiebreaker after its 13-10 win.